Dolores Bacon (pseudonym of Mary Schell (Hoke) Bacon, 1870–1934). Operas that every child should know: Descriptions of the text and music of some of the most famous masterpieces. New York: Grosset & Dunlap, 1911. Illustrations by Blanche Ostertag (1872–?). 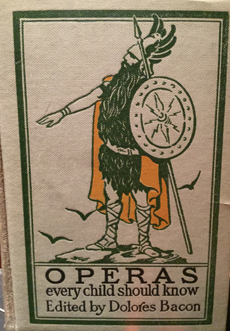 460 pp., color frontispiece of Brünhilde the Valkyrie, musical examples throughout text, decorative endpapers, original illustrated boards. “It is not at all probable that anything so ridiculous as the “Magic Flute” story was ever before written. It might have been the concerted effort of Artemus Ward, Theodore Hook, Bill Nye, and Mark Twain. But an effort at coherence must be made in the putting together of this story, because the opera is, above all things, one that every man, woman, and child should know. Mozart’s lovely music could not be ruined, even by this story. I couldn’t agree more with Dolores, even if the New York Directory doesn’t exist. As I write this, I am listening to Mozart’s The Abduction from the Seraglio (Die Entführung aus dem Serail) which certainly should have been part of this work. It certainly qualifies for inclusion on Bacon’s ridiculous scale. I still don’t understand why anyone bothered to compose an opera after Mozart. Thirteen chapters include the usual suspects such as Beethoven’s Fidelio, Bizet’s Carmen, Humperdinck’s Hansel and Gretel, and Sullivan’s Pinafore, as well as three operas by Verdi and Wagner’s Ring. Two operas by Balfe and Flotow are included “because they were expressions of popular taste when our grandfathers enjoyed going to the opera” (Bacon’s justification in the foreword at p. v). A new edition of this book would jettison nods to grandparental taste. I would include Shostakovich’s The Nose, Janácek’s The Cunning Little Vixen, and Knussen’s Where the Wild Things Are for a start, along with much more Mozart. This book is the 21st in an unnumbered series entitled Every Child Should Know. On the spine, a color logo for the series appears in a printed box as E·C·S·K with a child holding a book. The original price of this work was 90 cents, or around 20 dollars today. The delightful frontispiece is unsigned but attributed on other evidence (publisher ads) to Blanche Ostertag, a prolific artist originally from St. Louis. She studied in Paris at Académie Julian with Jean-Joseph Benjamin-Constant (1845–1902). Ostertag returned to the United States and set up her studio in Chicago, creating art glass and mosaics. Most famously, she created a glass mosaic mantel for Frank Lloyd Wright and the residence constructed in 1899 for Joseph and Helen Husser in Chicago. Located in what is now known as Uptown, the Husser residence was demolished in 1924. Ah Chicago, a wrecking ball is always waiting in the wings. Ostertag moved on into other media, as an illustrator for magazines and books as well as a creator of posters, leaving Chicago for New York around 1908.